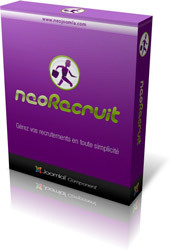 NeoRecruit is now Joomla 3 ready ! I'm pleased to introduce NeoRecruit 4.0, the latest version of the recruitment component, now available for Joomla! 3.x. If you are working on Joomla 3.0, 3.1, 3.2 or soon on Joomla 3.3 and then 3.5, you can now install the component on the latest versions of the CMS ! Instead of just adapting the previous version of the component to simply make it functional both under Joomla 2.5 and Joomla 3 (with the risk to have some compatibility problems, and being forced to restrict some features), the component has been all rewritten for Joomla 3, which now allows NeoRecruit to benefit from the potential of the latest versions of the CMS. the use of the Twitter Boostrap framework (natively integrated in Joomla 3), which allows to substantially improve the rendering of the form fields (especially the select lists), independently of the browser you use. Furthermore, this new version should not be considered as an ending point, but rather as the starting point for a new series, specific to Joomla 3. Some other natives features of the latest version of the CMS will soon be integrated too, I'm talking here about tags, multilingual items and versioning for example. These features have been integrated into the component's roadmap, in addition to the other developments planned previously, especially the form fields manager, that will be the next important improvement for the NeoRecruit component.